If you need a super versatile diagnostics tool for your car, the ANCEL FX4000 might be a model you should look into. For one, all you have to do is plug it into the 16-hole pin in your car. It comes with its own cord and display so you don’t need to use any other hardware. It’s a diagnostic tool that operates in many different languages, and it can be used for virtually any brand name and make of car out there right now. When all is said and done, the ANCEL FX4000 supports over 40 different car brand names worldwide. It does take some practice to get the hang of, but when compared to other diagnostics tools, this one is actually fairly simple, not to mention worth the investment. First of all, the ANCEL FX4000 is compatible with both BOD II and with CAN. This means that it works for all kinds of domestic and imported vehicles as long as they are 1996 models or newer. In other words, this scanner can be used for pretty much any car that you might have. This is also true as far as both diesel and gasoline fueled engines are concerned. The ANCEL FX4000 is a systems diagnostics tool that comes with a whole lot of features. It can do everything from displaying live data and providing you with error codes and the ability to clear them, to being able to perform emissions tests and more. It comes with its own display, it’s fairly rugged, and very easy to connect to your vehicle as well. This is a very highly customizable scanner that can check for pretty much any kind of issue that you might be having with your vehicle. If you are a car technician, or just have a car and want to fix it yourself, the ANCEL FX4000 is a good choice to go with. Although it does take some practice to get the hang of, generally speaking, this tool is quite easy to use. It can scan your car in pretty much every way possible, and it supports over 40 different car brands from around the world. If you are tired of paying big bucks to have your car dealership do simple things like reading codes, the ANCEL FX4000 is a good option, especially if you want to save both time and money. It might be a bit pricier than other options on the market, but in our opinion, it is well worth the investment. When you buy the ANCEL FX4000, you get the display module itself. It’s nice because you can use the 16-pin connecter to hook it up directly to your vehicle. You don’t need to install any kind of software or use a computer or smartphone. You get a large and high-definition TFT display that is easy to read and to control. It even has customizable and easy to access FN buttons for ease of use. This scanner comes with a lifetime of free updates. It does not require any batteries or a charger to function. The ANCEL FX4000 does have a very wide array of features to help you identify and solve any kind of issues that you might be having with your vehicle. First off, it can perform a range of tests on your car. It has the ability to perform O2 sensor tests, emissions tests, I/M readiness tests, and several others too. All of this data can be viewed via live data stream, and both in text and graphic format. Moreover, you can also read the data in freeze frames for a more detailed analysis. 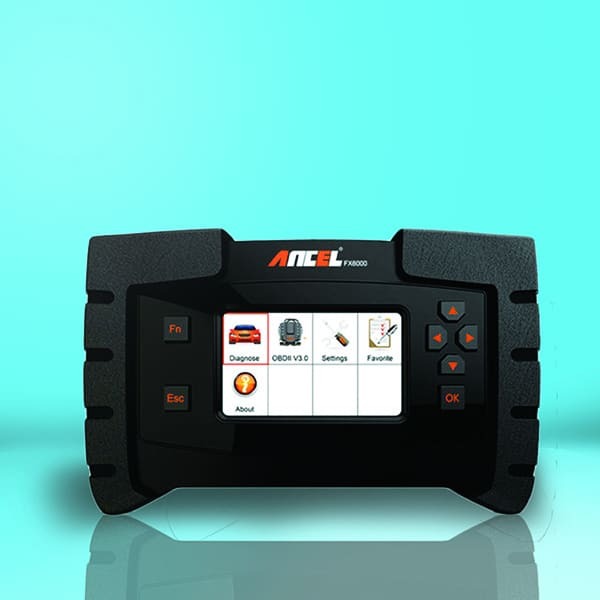 What is also nice about the ANCEL FX4000 is that it has the ability to read, scan, and clear pending and stored codes so you know exactly what is going on with your vehicle. What is also cool here is that the ANCEL FX4000 allows for FN keys to be fully customized. It’s convenient because you can therefore customize hot keys for your next vehicle test. There’s also the fact that this item functions in over 10 different languages so everybody can use it. The ANCEL FX4000 also has the ability to scan your ABS system, AC system, SAS steering, oil service resets, EPB, SRS, engine transmission and much more. Chances are that this item will have all of the codes available, and will even provide you with potential remedies too. All you have to do to start the ANCEL FX4000 is plug it into the 16-pin connecter and power up your engine. The design of this item is pretty neat too, as it is made with a video gaming grip system and is quite durable overall. While the ANCEL FX4000 does have a couple of problems, overall it is one of the best diagnostics tools that you will ever get your hands on. It might be a little hard to understand at first, but once you get the hang of using it, the ANCEL FX4000 can be used to diagnose and solve pretty much any issue your vehicle might be experiencing.